Early symptoms of arthritis are best treated with chiropractic. Early symptoms of arthritis is a complex subject, so there's a long page ahead of you; settle down with a nice, hot drink, or come back later. You have been diagnosed with spondylosis of the joints, perhaps. So, what’s so unusual about that? Everybody eventually gets it, isn't that right? It’s like grey hair. Here below you can see incurable but very treatable wear and tear of the tiny joints in the neck that may be the underlying cause of carpal tunnel syndrome or a frozen shoulder, for example. This kind of degenerative change often causes tingling in the arms and hands. Responding in this way to a friend who anxiously tells you they have arthritis may sound like a crass statement and, yes, it is. It’s a reaction to a very poorly worded diagnosis. It’s about as vague as telling someone they have lumbago. There are hundreds of causes of low back pain, from extremely serious, like cancer, to a little tiny ache periodically. Lumbago is a meaningless term, and really the word arthritis is too. Why is that? Because there are over 100 types of arthritis and many of them are quite different. Osteoarthritis, gout and Paget’s disease are all forms but they have very little in common, except that all three affect the joints. Very often we are faced with a condition that really should be called arthrosis, not arthritis; the early symptoms are quite different. Why is that? Because there is no inflammation. And that's why anti inflammatory medication doesn't help. This page was last updated by Dr Barrie Lewis on 22nd March, 2019. Getting the joint moving again, thus increasing the synovial fluid flow in the joint, and rehabilitating the surrounding tissue is what will relieve the pain and disability associated with osteo arthritis in the neck associated with the cervical facet syndrome, for example. The early symptoms of arthritis, probably all forms, invariably will include first pain and later, as it becomes chronic, stiffness. An ounce of prevention is what it's about. Highly regarded medical journals report strong research that people who eat vitamin C rich foods are three times less likely to get arthritis. What is the place of xrays in the diagnosis of the early symptoms of arthritis? It is widely acknowledged that in early rheumatoid and psoriatic arthritis, for example, before there's any bone damage, that xrays are likely to be insensitive to the soft tissue damage. In these two types of arthritis, blood tests and MRI and ultrasound scans are far more effective in testing for the presence and progress of any disease process. And so it is with osteoarthritis. The artfully done physical examination yields far more information about the impending disaster, even when xrays looking for bony changes are quite normal. All berries are rich in anti inflammatory phytochemicals; perhaps how to make mulberry jam, with little sugar, could give you a year round supply of these wonderful protective substances against arthritis. 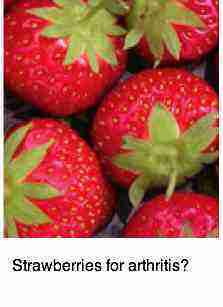 Interesting facts about strawberries ... rich in vitamin C with proven anti arthritis properties. Zeaxanthin macular degeneration gives anti inflammatory protection not only to joints but also to the eyes; are you regularly enjoying corn, kale and spinach? Let your food be your medicine was the advice of Hippocrates. 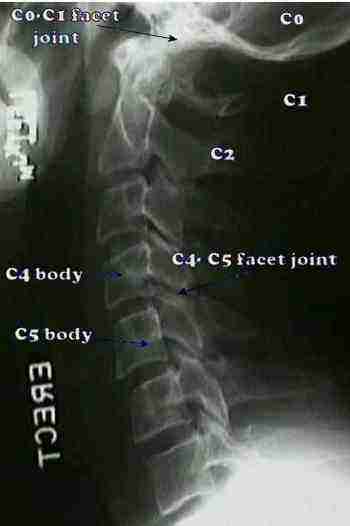 Whilst the early symptoms of arthritis are discomfort and stiffness in the neck, the early signs are loss of the normal curve in the neck and sclerosis as seen the C4-C5 facet joint below. Just because it's common, doesn't mean it's normal. It confirms that discomfort and often headache that you are experiencing. Why is it so common? Because frankly few escape whiplash injuries of the neck, be it car accidents, falls skiing or from horses, tripping on the stairs or a blow to the head. Most of it, like diabetes, say, is incurable; hence the place for maintenance care. The low back contributes enormously to arthritic sufferers, and much of it can be prevented. How? Watch for the early symptoms of arthritis. If you have a short leg, wear a heel lift. It's so simple to prevent the early and later symptoms of arthritis associated with a leg length inequality. Leg length inequality and how it causes arthritis. An untreated disk herniation results in loss of disc space, and ultimately you have bone grinding on bone. Food to avoid with arthritis is irrelevant in this situation. Having that bulging disc reduced (with chiropractic, of course!) is what's important. 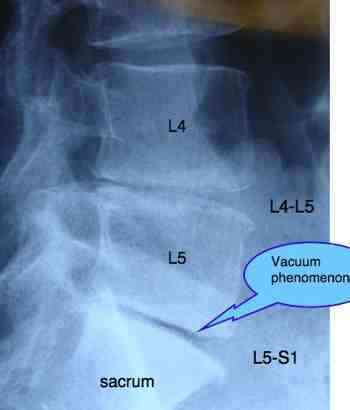 Degenerative lumbar disc disease case file is every day reading at the chiropractic coalface. Sacroiliac Joint Treatment and mobilisation of Sacro-iliac joint (SIJ) fixations will help prevent the most common wear-and-tear arthritis from developing. Early symptoms are pain and stiffness. 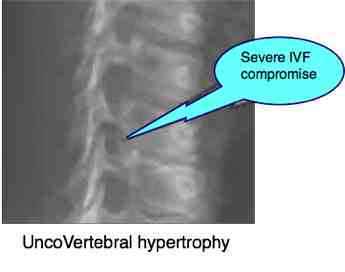 More difficult are the inflammatory diseases like ankylosing spondylitis that has a fondness for the sacroiliac joint. In a break-through study in the Netherlands, researchers found that unloading the knee with advanced osteoarthritis using an external fixation device (for two months), increased the synovial fluid flow through the joint resulted in dramatic sustainable improvement after the device was removed. Pain was reduced from 80% to 8% and function improved just as dramatically. Again, early symptoms of arthritis are pain and stiffness. Read more about knee joint distraction. Osteoarthritis in the knee is strongly associated with OBESITY. Clarke's test for arthritis under the kneecap. Read more about theleg length inequality research confirming how a simple heel lift can help reduce arthritis in the knee and hip. It’s perhaps useful to think of two distinct kinds of the arthritis; the early symtoms are usually quite different. Those forms that are systemic, meaning they can affect many joints and even other organs; Harvard medical school found that a chicken bones bouillon is more effective than their most potent drugs. For example , GOUT may affect the great toe (classically) and other joints far from the toe, like the shoulder. Some forms of these whole-body arthritides, quite distinct diseases, also affect the organs. They can change the skin, the kidneys and the heart, for example, … almost any and every organ system in the body. The crippling pain that a child might get with Juvenile Rheumatoid Arthritis (systemic) is light years away from the painful degenerative arthritis knees that the obese get. It’s also from a quite different planetary system to Immobilisation Arthritis, now proved to be the most common form of Osteoarthritis, which mostly responds very well to chiropractic. Where is all this leading us in our discussion of the early symptoms of arthritis? It’s probably true to say that straight chiropractic can’t do much to help in the treatment of the systemic arthritides, except in a general sense, by keeping the body in harmony with itself through gentle adjustments, stretching and exercises. Fortunately the systemic arthritides are relatively less common. But if you have an attack of extreme pain of arthritis in feet especially in your great toe, and it becomes swollen, red and hot, then for heaven's sake go to your medical doctor first, not your chiropractor. The inflammatory changes of gout are best managed medically. "Illness is the doctor to whom we pay most heed; to kindness, to knowledge, we make promises only; pain we obey." But the most common form is called Osteoarthritis, and a major subdivision of it called Immobilisation Arthritis; it's what we chiropractors work with day in and day out. The early symptoms of arthritis are our bread and butter, and chiropractic is probably the best form of treatment for localised painful and stiff joints, because mostly it’s not inflamed. It's really an arthrosis, not an arthritis. Once those early symptoms of arthritis are allowed to become chronic then any hope of a cure dwindle, and you are likely to develop advanced arthritis and regular chiropractic treatment will probably be your lot. Chiropractic help is the treatment of choice for the non-inflammatory types of arthritis, but really it has little to offer in the care of rheumatoid or gout; if you are experiencing the early symptoms of arthritis then my profession should surely be amongst the considerations. Anti-inflammatories are not the treatment of choice – getting the joint moving again is, and that’s what chiropractic excels in. Keeping the joints moving, increasing the synovial fluid flow in the joint, and then exercising the joint is what Chiropractic is about. Eating healthily is what ensures the joints are bathed in the the fluids containing the right ingredients. And yes, there are some food to avoid with arthritis - more about that later. Whilst much remains mystery, much is also clearly understood. Exercise the body, consider new ideas to stretch your mind, feed the spirit, an apple a day; it does keep the doctor away. The chiropractor too! It's now beyond debate. What we eat, and don't but should eat, has a profound effect on our joints. Are you getting enough allicin benefits from your diet? Probably not. Let your food be your medicine, and your medicine your food; whenever the early symptoms of arthritis begin, think perhaps of growing green beans, celery or spinach rather than painkillers. What do all forms of this large group of disease have in common? They affect the hyaline cartilage that covers the ends of bones. 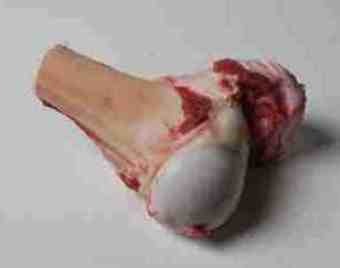 This cartilage makes it easy for bones to articulate easily with a neighbour. It is white, hard and very smooth, with a glistening look about it. Does that interest you? Next time you have leg of lamb for dinner, before you throw the bones into a pot to make a broth for your next soup, cut open the joint and take a good look. It's fascinating; the cartilage is like highly polished marble. Believe it or not, its slip index is lower than ice on ice. 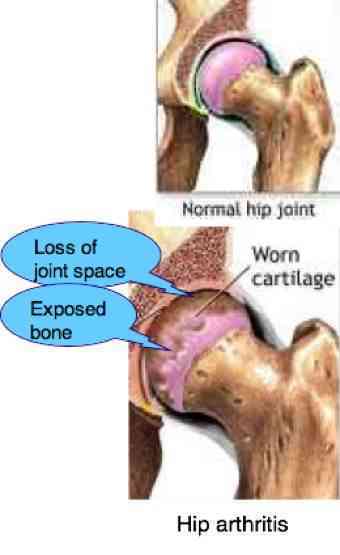 But when the joints degenerate, this cartilage becomes rough and pitted. Then come the early symptoms of arthritis; stiffness first usually, and then pain as the disease progresses. Professor Bijlsma, a feted Netherlands academic, admits that in the early stages of osteoarthritis there is a marked discrepancy between the early symptoms you may be experiencing and what's seen on radiographs. In clinical terms, this translates into pain and stiffness as the fixated joint, for example in the neck after a whiplash injury, starved of nutrients, begins to complain; but nothing is seen on the xray. Or, as we say in scientific lingo, radiographs are likely to be insensitive in patients with early osteoarthritis following trauma. Again, the early symptoms of arthritis are pain and stiffness. And so the diagnosis is made. Your doctor tells you there is nothing wrong; all you need is some painkillers and perhaps a massage. He's not up on the latest research. You are developing immobilisation arthritis. Do nothing and you will soon have a very stiff neck and the threat of arm pain from a pinched nerve. This is not a silent disease like diabetes; you know there's something wrong and you're right. As the famous Eliza Doolittle said, just you wait, Henry Higgins. Only then, if the fixation is not released, do the early symptoms of arthritis turn into the advanced degenerative joint disease we so often see on xray ten years later after a whiplash accident. Prof Bijlsma went further to admit that placebos has been the most effective medical treatment they have found for osteoarthritis in many scientific research studies. Chiropractic can do better than that. There is plenty of strong research proving that an adjustment of the joint is what will reduce the pain and stiffness, together with some good rehabilitation exercises so that you don't need to run off to your chiropractor twice a week for the next ten years. Think of a very important vitamin like substance called betaine, found in dark green leafy vegetables; it's profoundly involved in the prevention of inflammation throughout the body including your joints. My favourite is the beetroot; and don't forget the importance of how to cook beet greens. 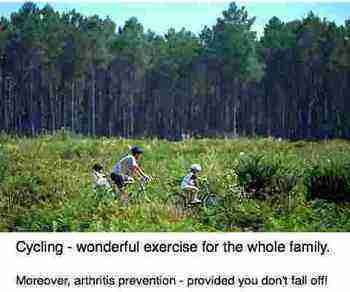 Exercise class benefits early symptoms of arthritis ... advanced arthritis too. Many studies involving thousands of sufferers have concluded that exercise benefits those who suffer from both Osteoarthritis and Rheumatoid Arthritis, improving function and lessening pain. Whilst most of these studies have been done on the knee, the principles apply to all joints. ANKLE EXERCISES to prevent degenerative joint arthritis in foot and ankle after a badly sprained ankle, for example. An index finger sprain can also lead to arthritis if not attended to; it can be difficult but need not necessarily so. Here in the main we are looking at processed foods. Yes, eating as your grandmother did, as veteran heart surgeon Dr Dwight Lundell recommends, does take more time; for me, I'd rather spend the time eating healthily, than visiting doctors. The big ones are white flour products, which is just about everything in breads, bagels, cakes and cookies, and white sugar which is in just about everything else. No wonder we have so many inflamed and angry joints, muscles and organs. In his lecture on foods to reduce inflammation, Dr Lundell was talking about the inner lining of blood vessels that appear ever more inflamed. The big one to avoid are, oddly and unexpectedly, are polyunsaturated oils, and that means a change to olive oil. The well known scientific journal Nature reports that olive oil contains a compound called oleocanthal which acts as a natural anti-inflammatory that has a potency strikingly similar to that of ibuprofen. Both these, oleocanthal and ibuprofen, inhibit the same cyclooxygenase enzymes that cause the early symptoms of arthritis and joint inflammation. Make for example your own pesto; it's so easy. For a couple of VERY easy olive and olive oil dips, click here for our OLIVE BREAD RECIPE and other dips. And a very simple olive garden salad dressingand, of course, an Olive Garden Salad recipe to go with your dressing! Make sure it has some baby spinach or kale leaves for the lutein and zeaxanthin. Olive pate is so easy to make. What we are suggesting here is do everything in your power to increase the natural anti inflammatory substances in your diet. My absolutely favourite herb, sweet basil, contains a scientifically proven substance called eugenol that is also a cox inhibitor. Sweet basil grows like a weed in the garden, and we make our own pesto in just five minutes right through the summer. It's better than pain, and better than a hole in the stomach. Delic. Read more about herbs eugenol oil. Anti inflammatory chili and extra virgin olive oil will indeed help with those early symptoms of arthritis like in gout and rheumatoid; it's the capsaicin and oleocanthal. You can pay a lot of money for these supplements, or enjoy them daily in your food. If you are suffering from the early symptoms of arthritis then it's certainly worth adding fresh anti inflammatory chili on a daily basis to your diet. We have it every day for breakfast in our eggs Florentine; just a slither. The chili family contains a strongly anti inflammatory substance called capsaicin; it's also used as a painkiller. 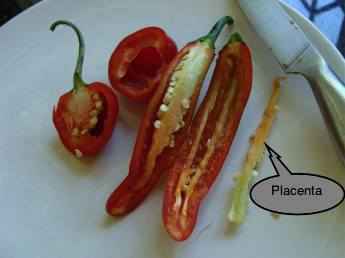 Yes, it's the heat in chilis, found mainly in the white pith called the placenta; the part that holds the seeds when you split a pepper. 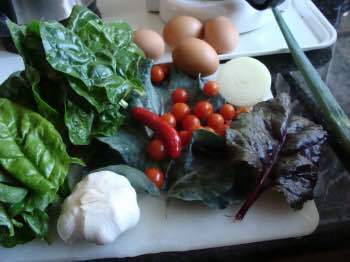 Lightly blanched takes the edge of your jalapeno; have one every day with your salad. How to grow chilis; the bright red fruit makes a beautiful plant in your regular flower bed. Do stake them though; when they are loaded with fruit the branches will sag and perhaps break. Read more about capsaicin health benefits. Omega 3 is what we all need more of in our diets to prevent inflammation; that's what the early symptoms of arthritis are all about. A high ratio of omega 6 to omega 3 is inflammatory, and often the underlying cause of arthritis. So increase the anti inflammatory omega-3 foods regularly in your diet. Not in pill form; in your food, and decrease the omega 6 oils. It's so easy to add a tablespoon of freshly ground flax seed to your cereal every morning. Grinding flax seeds is simple; and cheap. Walnuts and pecans nutrition are also good sources of omega-3 and the vital gamma tocopherol form of vitamin E; that's the one that helps prevent prostate cancer. This fatty fish soup recipe is probably the best of the lot; ways to cook salmon is another favourite. Nuts, seeds and fish incidentally come up tops in the research to prevent heart stroke diabetes too, the so-called cardiometabolic diseases. What causes these degenerative changes in the joint cartilage? Hundreds of causes, and they need to be managed in quite different ways. It could be injury, a fall, fracture, whiplash ... it could be infection, a bug ... a short leg ... obesity ... and in the case of gout what is needed is medication to lower the uric acid in the blood. Gout is one of the most treatable forms of systemic arthritis. Could hydrogenated foods and margarine have an effect on arthritis? We just don't know, but we do know they are bad for you. For years I was slightly apologetic for recommending butter, but no longer; a new meta analysis of 80 research projects concludes there is no scientific basis for you to change from butter to margarine. In short butter is back and you can certainly again enjoy your low GI bread. You do need to be serious about your health though to go the next step and grind your own healthy flour. Millers can still call it "wholewheat flour" provided no more than 40% of the content has been removed. It's important to grasp the whole wheat vs whole grain controversy; they are not the same once you've removed much of the bran and germ. What may come as a surprise when you start baking your own bread using healthy flour is that you no longer need to dicky it up with processed meats, sweet jellies or expensive spreads that usually have added hydrogenated fats. Nevertheless, something to raise the blood sugar when worn out is helpful sometimes. We love berries for the antioxidants and how to make mulberry jam is one of the simplest. Make sure you are getting your greens; they are a rich source of iron, folate and a host of essential phytochemicals. We enjoy this eight colors eggs Florentine for breakfast. This chicken broccoli recipe gives you the double anti arthritis combination of the cartilage in chicken bones and folate in greens; that's a double winner; easy to cook and tastes divine too. Mushroom soup made with this chicken bones bouillon is rich in selenium, B vitamins and anti-inflammatory phytochemicals that will help prevent those early symptoms of arthritis from ever appearing. These mushroom soup recipes can be made in only half an hour; don't get them from a can where they'll have far too much salt. Since mushrooms are also a rich source of vitamins B6 and B9, and C (three of the four needed to prevent the progression of frailty syndrome) they should regularly be on the menu for older folk too. It's now widely accept that fish oil is no only good for your memory, your heart but is also a powerful anti-inflammatory. There is food to avoid with arthritis and there is very definitely food to include. So, fish oil for your arthritis too. But just how much ...? HOW MUCH FISH OIL ? What you can’t see in Mary’s little lamb’s hip (sorry, that’s in poor taste! ), is that the joint is bathed in a fluid. It is this liquid that feeds the cartilage, and the most common form of OA is called Immobilisation Arthritis (IA), when this fluid is not adequately replaced by the body. Oleocanthal has been isolated as the active ingredient in olives that gives them their anti inflammatory properties. Oddly, one of the premier arthritic joints is not a weight-bearing joint (like the hip) but in the shoulder. A little hinge joint, called the ACROMIO-CLAVICULAR JOINT is a primary cause of shoulder pain. For more about the AC-joint and shoulder pain, click here. ACROMIOCLAVICULAR JOINT ... the early symptoms are difficulty raising the arm. Interesting research from Melbourne, Australia confirms that walking actually increases the volume of cartilage in the knee. What this 14 year study confirms is that we should not fear exercise, but rather should grasp it whole heartedly. It actually reduces arthritis. The real enemies of joints are a sedentary existence and a poor diet. Are you a couch potato, and still on a black and white diet? Pain, lots of it, and deteriorating health will soon greet you enthusiastically. You, though, may not be so happy. Read more about knee arthritis and exercise. What, if anything, can chiropractic offer to the patient suffering from serious arthritis pain in knee? Would you be satisfied with 50 percent less pain and disability instead of the expense and risk of total knee replacement? Then consult your local chiropractor. Non steroidal anti inflammatory drugs are potentially dangerous at the best of the times, even when taken in the sensible and lawful manner. When used with Pfizer's devious and dishonest labeling, the food and drug administration fined them 2.3 billion dollars in damages. Read more about Pfizer Bextra; that's the name we associate with gross drug company fraud; certainly it's not medication for the early symptoms of arthritis; probably not for any conditions. Interestingly, this morning, I listen to Dutch radio, there is a general notification in the Netherlands that if you are taking over the counter anti inflammatory drugs you must notify your doctor because of potential strokes. In particular, taking two different medications, say brufin and aspirin, is especially dangerous. Arthroscopy knee surgery is a common procedure today, yet medicine's own research raises concerns. Health care is full of "incidental findings." Things significant, but not the cause of the problem. Neck arthritis is one of them. Should you be taking Ritalin for any reason, note that headache and joint pain are two of the side effects, and could easily be construed as early symptoms of arthritis; read more at attention deficit Bernie. One of the earliest symptoms of arthritis are often felt in the lower back and hips; see how this elderly patient responded to chiropractic care. Ankylosing spondylitis symptom describes a pernicious form of arthritis usually well managed with Chiropractic. BackPain ...? Chiropractic manages it MUCH better than pills. More safely too.